Small yet noticeable, this cross pendant is made from beautiful green amber and sterling .925 silver. There are six tiles of amber each protruding out just a little bit, allowing sparkles to appear when the sun hits it. A simple and thin bail helps showcase the cross. 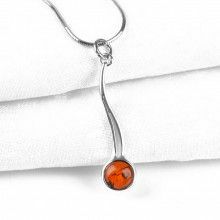 The simple yet elegant design of this pendant is indeed timeless and is sure to be cherished from generation to generation.